In Bulgaria a man sends his best friend to the home of the woman he would like to marry. The approval of the woman's father is needed. When he decided that there will be a wedding he symbolically asks his daughter if she would like to marry the certain man. She has to give a positive answer three times. After that the potential groom will be invited to personally visit the woman's home. During that visit the engagement party will be held. Bulgarians have stag and chicken parties. They are based on local traditions. Weddings are traditionally held on Sunday. On Thursday before the wedding bride's mother makes "pita" or "pitka". It is a traditional round bread. This kind of bread is prepared for both couple and the guests. There is one more object that plays an important role in the Bulgarian wedding. It is a wedding banner. It is made by the groom's best man. A flag pole is made out of a fruit tree. It is some 1.8 meters long. An apple wrapped in the golden or red foil is placed on its top. It symbolizes fertility and the Sun. The pole is decorated with various colourful ribbons, ivy etc. It is interesting to mention that in some Bulgarian regions people make a white flag for the bride and the red one for the groom. A single flag pole with red and white flags can also be seen. The wedding day rituals start in the groom's home. Traditionally groom's friends pour some barley on the groom. Some guests have weapons. They shoot in the air. It is believed that by doing so the evil spirits will stay away from the whole event. The groom's parents bless their son and wish him all the best in the future life. The groom and the guests then go to the bride's home. From that moment on the best man is the one who manages the events in the wedding day. There are several events going on in the bride's home. The groom and the best man try to enter the room where the bride and the best woman are staying. But it is not easy. Funny negotiations are needed. Before getting out of the room the bride has to have a veil on her head. It is put there by the best woman. She tries to do it three times. You guessed right. She does it on the final try. In Bulgaria a bride often carries little bit of garlic to fight the evil spirits. It is believed that the bride's veil should include something red. This should bring good luck in her future life. The wedding procession then goes to the church. Most Bulgarians are Orthodox Christians. According to an old belief the bride and groom must enter the church with their right foot. Wedding rings in Bulgaria are worn on the right hand. After the wedding ceremony the newlyweds must sign the documents. What follows is kind of a game where the bride and groom try to stomp on each other's feet. The winner and that way dominant party in the future life is the person who does it first. Everyone then goes to the venue where the wedding reception is held. Everything starts with a ritual where the groom's mother welcomes the couple. She puts a special white cloth and some flowers on the floor in front of them. This should symbolically show the couple's happy future life. After that the groom's mother will give the couple some honey cake and wine. She then holds a bread above her head. Both bride and groom have to take a piece out of it. Whoever has the bigger piece will be dominate in the future life together. The wedding reception includes lot of dancing. In Bulgaria the best man and best woman are the first who start to dance. In parts of the country the newlyweds have to earn the wedding cake by dancing. Let's again return to the above mentioned wedding flag. After the wedding the flag is given to the bride. The flag pole is destroyed. The apple is eaten by the couple. There are communities in Bulgaria with quite unusual wedding traditions. That is why they are mentioned here after those most common ones. Ribnovo is a mountainous town in the southwest of Bulgaria. People living there are known as the Pomaks. They are Muslims. They usually wed sometime from November to March. Their wedding traditionally lasts two days. Certainly the most interesting tradition in the local wedding is called "gelina". It is held in the bride's home. 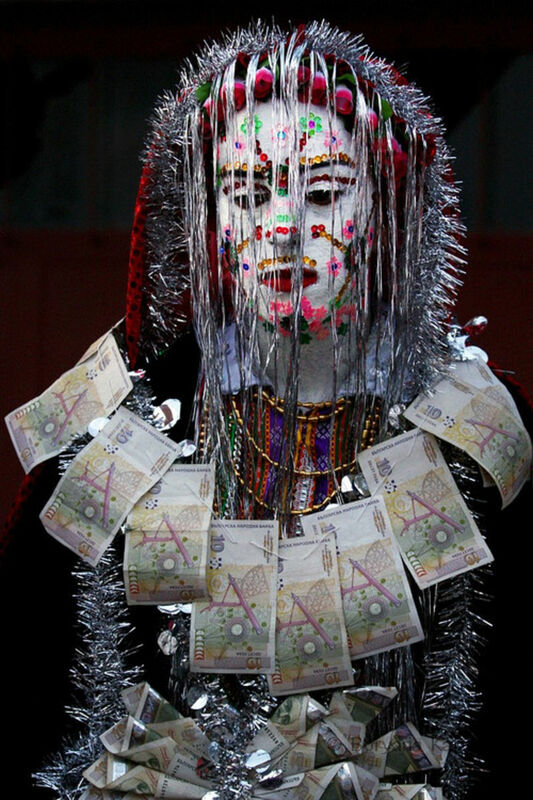 A white substance and various coloured decorations are put on the bride's face. Pink flowers and shiny red piece of cloth are put on her head. Silvery coloured stripes are also attached to the head. The bride is dressed in the traditional wedding dress. Black and red are the dominant colours in this dress. After the arrival of the bride to the groom's home he removes the decorations from the bride's face.